This classic New Orleans dessert is another creation of the late dutch Chef Paul Blangé of the early days of Brennan’s, and is now known worldwide. Created in 1951, Bananas Foster is named for Richard Foster, owner of the Foster Awning Company, chairman of the crime commision to clean up the French Quarter, and at the time, frequent customer of Brennan’s. 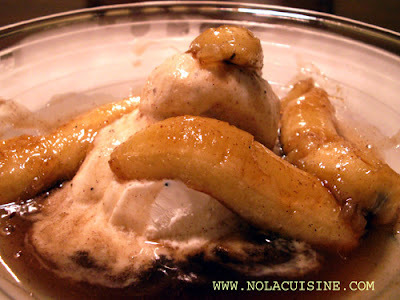 Bananas Foster is simple, elegant, and sinful all at the same time, and one of my absolute favorite desserts. I’ve adapted my recipe from the Brennan’s version with a few changes. I took the seemingly strange addition of toasted sesame oil from the recipe for Bananas Bliss from Paul Prudhomme’s book, Louisiana Tastes. Once you taste the nutty depth of flavor that it adds to the dish, you will never go back. Continue to baste the banana slices until the flames subside. Serve over the ice cream on a chilled plate. wow, these pictures are so amazing. i can taste the bananas through my monitor!! The recipe is great but the pictures are amazing. You are quite the food photographer. I love Bananas Foster. This looks soo good. I sure am going to use your recipe. I was wondering if you could please e-mail me the bananas foster recipe for 500! We are hosting the 2006 Lorain County Cancer BAll here at DeLuca’s and this is what they asked for their desert! Thanks and your help is much appreciated! multiply the above recipe x 500, dummy! This recipe is great i want to try it,but how i made banana liquer,because it is not available near me. this was originally made using pisang ambon liqueur. very,very had to find. i have 3 750ml bottles of it and several 50ml ones. use it IF you can find it. check ebay for them.. a pisang is a tiny green banana..
i also use havana club rum another impossible item to find. if you see them on ebay grab them as ebay will pull them because they come from an embargoed country.. i have several from light to dark..